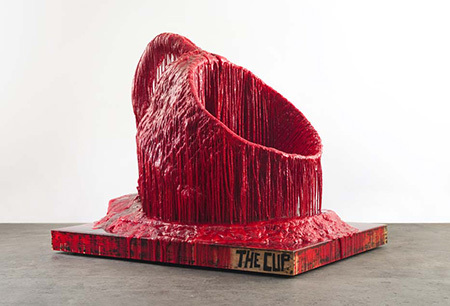 One of the most striking sculptures in this exhibition featuring the work of L.A.-based Sterling Ruby is “The Cup” (2013). One of several monumental sculptures, it stands over seven feet tall, a bright red cup dripping in urethane and tilted on its axis. It’s the perfect manifestation of the Greek notion of “autochthonic,” read as something that springs from the earth, self rooted and determinant of its own being. The piece seems to burst forth from a pool of lava. Ruby is known for his eclectic array of materials that range from bronze collage-based sculpture, fabric pieces, ceramics, assemblage art, and pieces that bare text and graffiti, sometimes layered in urethane. His inspiration comes from current events, graffiti culture, pop culture, and the dreadful state of the prison system and corporal confinement. Ruby mines art historical movements from the early avant-garde such as the Bauhaus school, Minimalism, and Pop Art. They serve as points of reference, but he veers from these sources in his own way, producing highly original and timely works. Over thirty selections are spread throughout the center. Seen together, they clearly illustrate Ruby’s investigation of high vs. low, freely crossing the boundaries of various styles, and the aestheticization of everyday objects and materials. Via pop art, the “Basin Theology” series consists of multicolored ceramic pieces fabricated with castoff studio detritus in hyper-scale size that is set in baskets or basin containers. These pieces, like many others here, induce us to question the nature of beauty and act as a reminder that ceramics are perfectly appropriate for advanced art far beyond mere craft or decoration. The same goes for the fabric pieces. Two of these, simply titled “Candle” (2015), one orange like a large carrot, the other a mélange of purple-blue and probably dyed in the studio, represent Ruby’s love of fabric and sewing by hand. They bring to mind Claes Oldenburg’s floppy fabric sculptures of everyday objects that became Pop icons. Here though, the patterns and colors are quite contemporary, the dark one drawn from street culture while the orange one is punctuated with a repetitive design pattern, suggesting a digital origin. An astounding piece, “The Pot Is Hot” (2013) stands sixteen feet tall, several elements awash in red urethane. They are made of wood and look like a brush and a kitchen utensil soaring high into the air. They sit in a drum covered in blue urethane, that’s in turn on a colorful wooden base. The entire ensemble brings to mind a soup can that may be used to store tools and pens on a desk in a studio or garage. Ruby channels modernism through the use of primary colors, but subverts its design austerity with the dripping urethane and overall asymmetry. The title is clearly visible on the exposed wood of one of the utensils, the text as much a part of the piece as the idea of heat, intensity and energy suggested by the entire structure. The entire exhibition glistens in the overwhelming abundance of natural light provided by the Nasher building itself. The curating allows Ruby’s ideas to build and multiply as we move from piece to piece and room to room, finally leading to the outdoor garden where more surprises await.